Talking Brains: Do Broca's aphasics have trouble comprehending degraded speech? Do Broca's aphasics have trouble comprehending degraded speech? Patients with Broca's aphasia are able to comprehend spoken words quite well, in fact, this preserved comprehension in the face of non-fluent speech production is a diagnostic criterion for the syndrome. This fact -- the dissociation between expressive and receptive speech -- demonstrates that the motor speech system is not critical to speech perception. Or does it? A study by Moineau, Dronkers, & Bates (2005) suggests that Broca's aphasics have trouble comprehending single words under degraded acoustic listening conditions. This finding has been referred to as evidence supporting an important role for the motor system in speech perception. E.g., see this comment. But how solid is the finding? 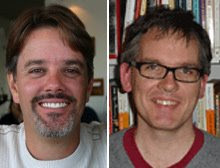 Moineau et al. tested three aphasic groups (Broca's, Wernicke's, & anomic), right hemisphere non-aphasics (RHD), and control subjects on a word comprehension test under two listening conditions, clear speech and degraded speech (low-pass filtered and temporally compressed). The comprehension test was a picture-word verification test: Subjects heard a word and saw a picture that either matched or mismatched. They indicated match or mismatch by button press. Non-matching pictures were semantically and phonologically unrelated to the target (to the best of my reading). In the clear speech condition only the Wernicke's patients showed any deficits on the comprehension task. In the degraded speech condition all subjects performed more poorly -- no surprise -- but now the Broca's patients performed statistically as poorly as the Wernicke's patients and both Broca's and Wernicke's performed worse than controls and RHD patients (Broca's did not differ from anomic aphasics, but Wernicke's did). In other words, single word comprehension deficits in Broca's aphasia appear to be uncovered by presenting speech in an acoustically degraded form, and under these conditions they look as bad as Wernicke's aphasics. This is a pretty dramatic result! And it provides prima facie evidence in support of a role for the motor system in speech perception/comprehension. But there's a problem. Two actually. The first is that the lesions in Broca's aphasia are not restricted to the motor system but also likely include many other frontal and parietal regions that may be important for attention, response selection, and other executive functions. Thus there is no direct evidence linking the motor speech system to the auditory comprehension deficit. The other problem is the way Moineau et al. analyzed their data. Recall that the task is to detect matches and reject mismatches. This is a classic signal detection design. An important factor in signal detection experiments is response bias. Some subjects may have a bias toward responding "yes" and others may have a bias in the reverse direction. This affects the results. Luckily there are ways of correcting for response bias, for example the d-prime statistic which uses the proportion of hits (correct acceptances) versus the proportion of false alarms (incorrect acceptances) to correct for bias. Unfortunately Moineau et al. did not calculate d-primes in their analysis. Instead they simply took the proportion correct in the match and mismatch trials to calculate accuracy scores and this could lead to biased, possibly invalid results. In fact, when they looked at accuracy as a function of "congruence" (whether it was a match or mismatch condition) they reported that Broca's and Wernicke's patients have opposite biases! 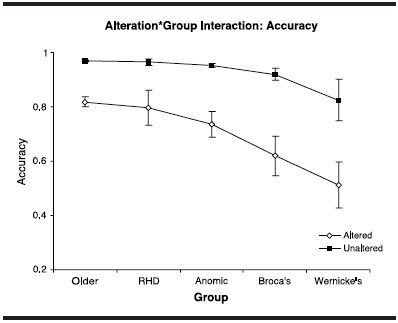 Wernicke's and control subjects performed better on the congruent trials (they tended toward "yes" responses) and Broca's and RHD subjects performed better on the incongruent trials (they tended toward "no" responses). Anomics showed no difference. These group differences in response bias suggest that the overall findings are indeed themselves biased. To illustrate the problem consider the following graph. At each point along the x-axis is a different pair of hit and correct rejection scores (indicated on the y-axis) that average to equal the performance level (roughly 63%) for Broca's aphasics eyeballed from Moineau et al. 's graph. These are values that reflect the reported bias, incongruent>congruent. The x-axis labels are the A-prime scores for a given pair of hit/correct rejection scores. A-prime is a biased corrected estimate of proportion correct (it's more intuitive to think about than d-prime scores). Notice that for the same average accuracy, the corrected proportion correct scores (a-prime) vary from .7 to more than .8 and that all of the a-prime scores are greater than the reported accuracy of .63. Average uncorrected accuracy underestimates how well subjects are able to discriminate matches from mismatches in this range of values. Here is the graph for the eyeballed Wernicke's score of ~53% average accuracy. These are the pairs of scores that reflect the reported bias, congruent > incongruent. Notice that most of the distribution of scores is in the 50-60% a-prime range (unlike Broca's which is higher) but also that there is an even wider spread of possible a-prime scores for the same average accuracy as reported by Moineau et al. So it is really quite impossible to know how well these patients are performing on the comprehension test when response bias is not corrected. One might argue that even the most generous a-prime score for the Broca's patients is still in the low 80% range and that reflects comprehension deficits. True, but remember that this has to be compared against the a-primes for the control groups and since we can't know their bias corrected scores, we can't evaluate how poorly the Broca's patients are performing. To be quite honest, this is a paper that never should have been published with this analysis. The concept behind the study is fantastic. It's a shame that we can't interpret the findings. So we still don't know whether Broca's aphasics have disproportionate difficulty comprehending acoustically degraded speech, and still no evidence that damage to the motor system produces significant deficits in single word comprehension. An important control for this kind of work would be a non-verbal discrimination task with variable levels of difficulty. For instance, a shape matching task or some other other purely visual perceptual task that can be matched on performance characteristics (e.g. error rates) group of controls. Take a look at any fMRI study of perceptual discrimination and decision making and you find all kinds of activation in: IFG, frontal operculum/anterior insula, premotor cortex, ACC, SMA, and so on. Lesions affecting these structures would almost certainly cause generic impairments on decision making tasks. Hard to get a 100 subjects, but that's what's needed! That is an especially important point when dealing with frontal lesions, particularly given that IFG may play a role in cognitive control/response selection (see a previous post). I think this is issue is also a confound in many studies of action semantics that purport to show a link between "motor cortex" and action word processing: action words tend to be harder to process than object words and in many cases (e.g., Parkinson's disease, ALS) the correlation is not with motor cortex proper but with IFG. I like your experiment idea. Let's start testing!